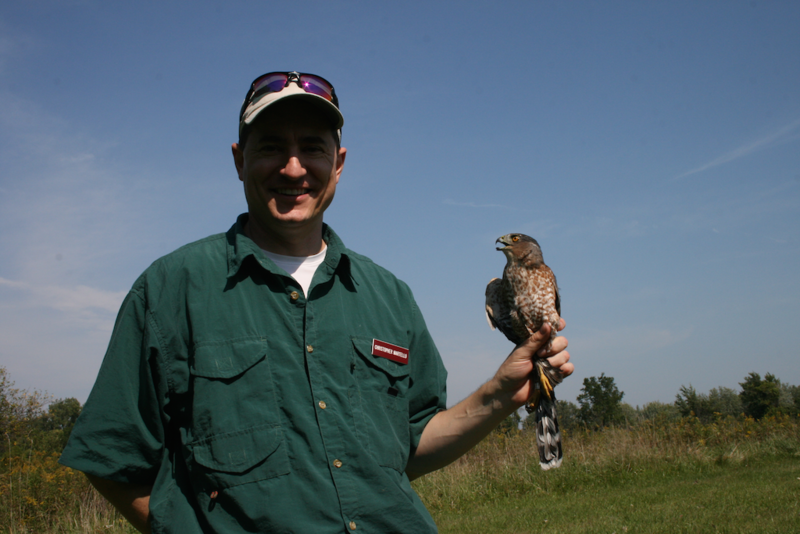 This past weekend was the HawkFest celebration of birders and raptor enthusiasts down at Lake Erie Metropark. 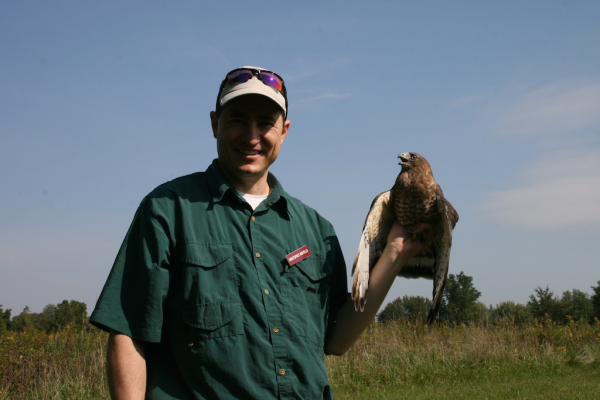 An avid group of birding enthusiasts keeps up the Raptor Count during the annual hawk migration from northern Canada through the United States across the Detroit River and down through the continental United States. 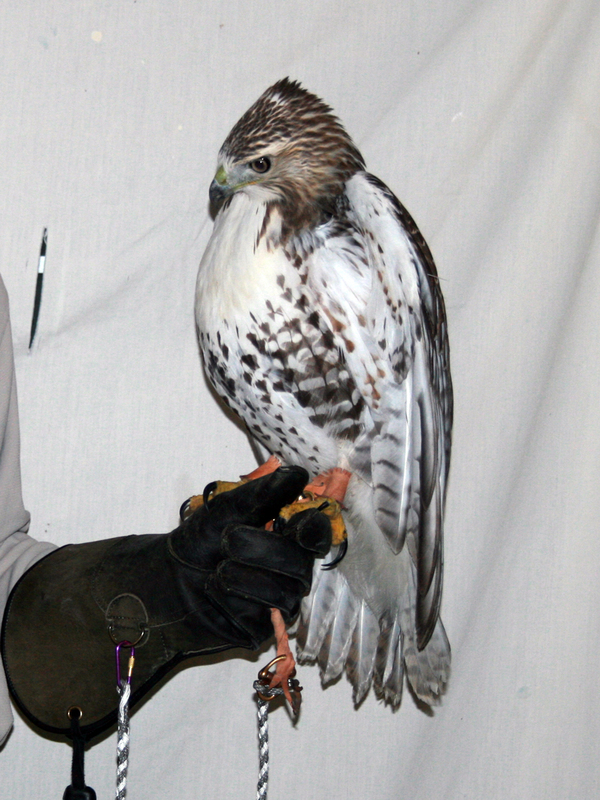 The HawkFest Celebration at Lake Erie Metropark coincides with this annual migration. 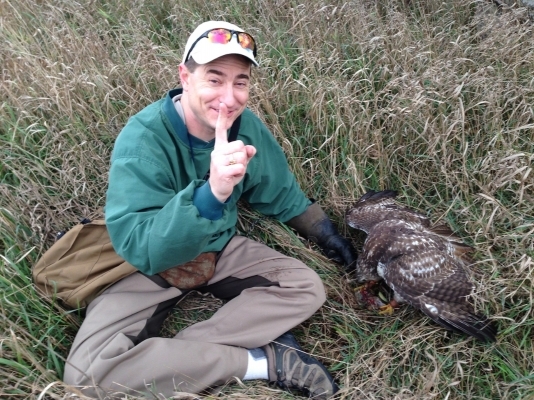 If there is a high point in the birding world of raptors in the State of Michigan, this weekend is it. I had the unique opportunity to participate in the bird-banding program held at the park by a few select avid bird banding groups. I’ve known about this for a while, but have never been able to participate, so this year I took the time to sit out in the trapping blind with a few fellow raptor enthusiasts and we settled in for some hawk trapping. 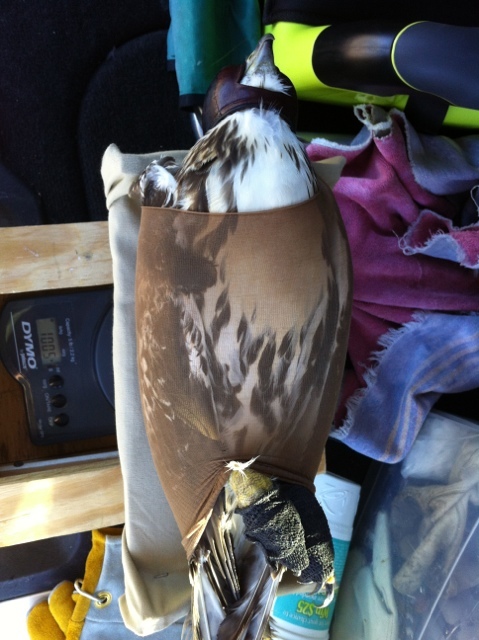 The trapping outfit is setup for catching, banding, and releasing birds of prey that are lured in by our bait animals. There were two bow nets flanked on two sides with dho-gazza nets that collapsed on impact. Occasionally, the bait animals act up, or in the case of our mouse in the B.C. Trap, he earned the nickname ‘Houdini’ because he escaped from the trap without so much as a sound when we weren’t looking. The starlings lasted throughout the day as long as we provided a small dish of water to keep them hydrated in the sun. As our setup was constructed out in a field, there was some of the grassy area that was mowed and kept short, but the surrounding grass was left high. The insect life an populations were in full swing, and the noise level was almost deafening from the crickets and grasshoppers, and the occasionally odd-sounding cicada in the trees changed up the natural ambiance. Once in a while, a large ‘leaf’ flew by the blind window, and upon closer examination, turned out to be a preying mantis. Hordes of Common Green Darner dragonflies were flying around every which-way and we were pretty sure that the gulls were diving on them for snacks. A few early customers that hit the nets turned out to be Sharp-Shinned Hawks, referred to as ‘Sharpies’ by birders (not to be confused with the markers). 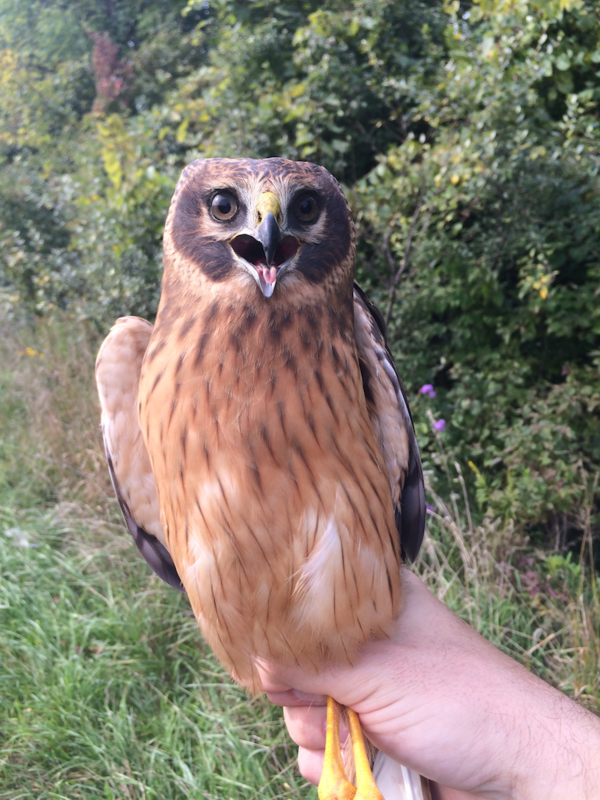 The best capture and release was an immature Northern Harrier who turned and cartwheeled into the net after the lure bird caught his attention. Later on in the day, we were treated to a Coopers hawk and a Broad-Winged hawk. 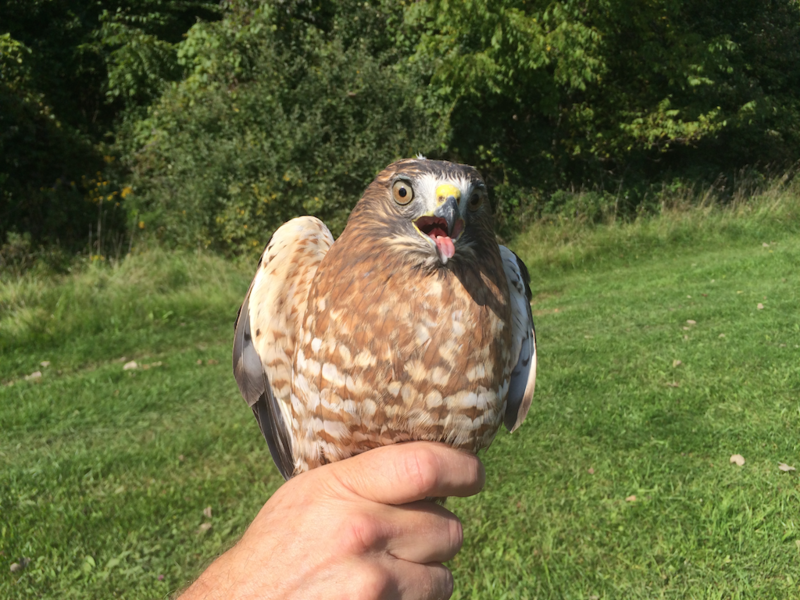 The Broad-Winged Hawk is the common standard at Lake Erie MetroPark during HawkFest. They can form giant kettles of birds within a few hours and can be seen moving across the sky in huge numbers. If you hit the migration and the weather on the right day, observation teams count hundreds of thousands of birds in a single day. 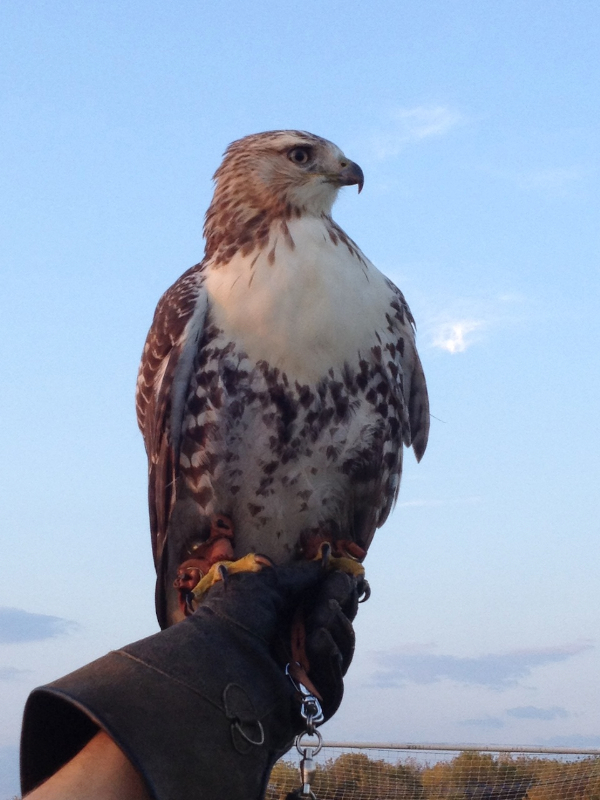 In addition to the birds that we trapped, banded, and released, there were many more raptors that were observed. A steady stream of Bald Eagles crossed over the trapping area during the course of the day and I stopped counting after 10 of them because there were so many. A few Sharpies and one Kestrel buzzed the nets, but became spooked when they approached the trapping area more closely. The highlight of my day was when we had a peregrine falcon swoop into the nets and checked off at the last possible moment. He was clearly visible coming into the lure area and was a delight to see. As for a first banding / trapping adventure, this was surely a pleasure and I am thankful for the wonderful trapping companions who were there to help identify, lure, band and release birds with me. It was a very fun day of falconry for me and one of the more fulfilling experiences to release banded birds back to the wild. Trap: Hit the trap quickly, but after 5 nights of trying and bumping. Cedar was relatively close to home, and with the light coloration of the head, I stalked her each night for a week in the hopes of catching her. Success for Cedar (and me) came on the 5th night when she finally didn’t bump when I tossed the trap. She is a beauty!